If you are looking for an alternative to an Indian treat, look no further. This curry is packed with flavour as well as protein and many other nutrients making it a total guilt free eat. Start by making a paste by whizzing up the onion, garlic, ginger, chilli and spinach. Set aside. Add a tsp of the coconut oil to a pot and heat until fairly hot, add the chicken and brown all over. Pour off any excess fat. Now add the rest of the spices (Coriander and mixed Curry powders) cook on a medium heat for two minutes. Now tip in the paste, cook gently for around ten minutes. Add the lemon juice, check the seasoning and add some salt and pepper if necessary. Cook for another ten minutes. You may need to add a dash or two of water depending on whether it is too thick. Now add the Greek yoghurt. Combine well and cook for five minutes. Serve with wholegrain rice, basmati rice or any variety of bread you fancy! Thailand I by far, my favourite place in the world. A few years ago, i was fortunate enough to do a cooking course in Chiang Mai. I order the Thai ingredients online and have them delivered as I feel there is no substitute for authenticity! More often than not, I do not grind my own paste. However, if using a pre prepared curry paste, ensure it is from Thailand! 3-4 Chicken Breasts, size dependant cut in very thin slices along the grain of the chicken. Buy really top quality chicken that is not injected full of water as it will ruin the curry. Thai Sweet Basil (Basil is not a substitute, sweet basil has an aniseed type taste) a couple of Handfuls, leaves removed and slightly shredded. Begin by opening the tins of coconut milk very carefully. Separate the very think creamy part of the coconut milk from the very watery part. In a saucepan, heat the watery part until you can see the oils of the coconut milk coming to the surface. Add the Thai paste and combine well. Cook on a medium heat for five minutes and check that it has your desired degree of flavour and heat. Add more if you want! Add the sliced chicken and stir well to ensure it does not stick together. Keep stirring periodically until it is almost cooked. Add the Thai vegetables and lime leaves at this point. Also, add the oyster sauce, fish sauce and, the palm sugar. Now, add the creamy part of the coconut milk. Cook over a medium heat until the vegetables are nice and soft. At the end, stir through the Thai basil. Serve with steamed Thai Jasmine Rice and top with the fresh red chillies. This is a wonderfully fresh, creamy and perfectly spicy. It tastes totally amazing, it is full of protein and low in fat because I used light coconut milk. The added bonus is, it is super fast! Start by tossing the prawns in the lemon juice and set aside whilst you get on with the rest. Heat a heavy based pan add a tablespoon of oil, add the onion and cook on a medium heat for around five mins, until softened but not coloured. Add the Turmeric, cardamom pods and chilli powder. Cook for two mins until fragrant. Add a dash more oil, throw in the Cinnamon, Ginger and garlic. Cook for a further 2 mins until cooked through. Add the coconut milk and bring to the boil. At this point, throw in the prawns and cook for 2-3 mins until prawns are cooked through. Serve with basmati rice and chopped fresh Coriander. 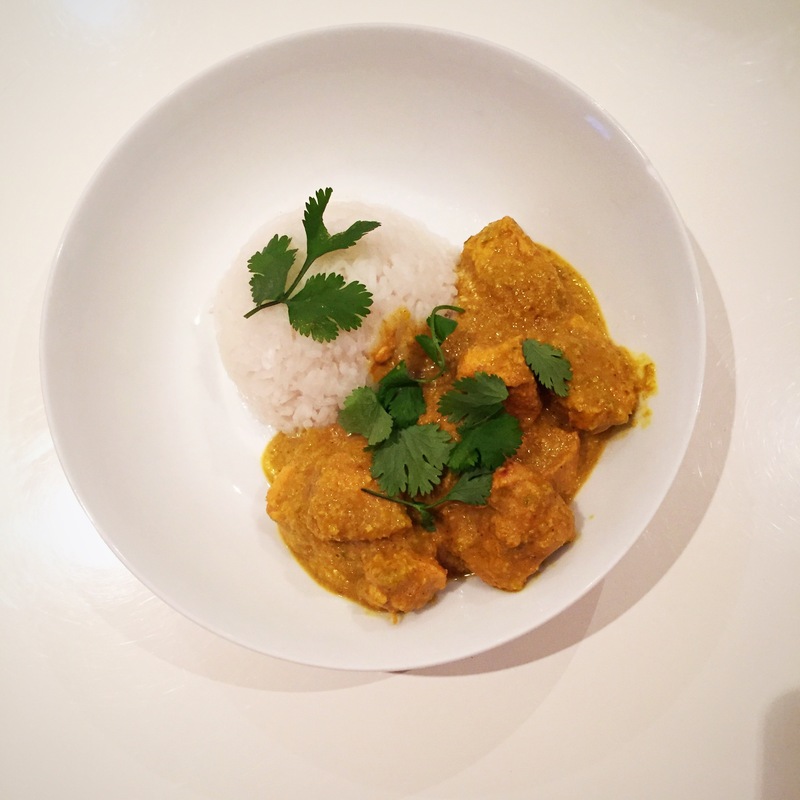 I created this last night as I wanted a curry to fill me up without the need for too much rice! I guess a kind of curry/stew! Add oil to a large pan and add the onions, cook gently for around 8 mins until nice and soft and golden. Add the garlic and ginger and cook for another few mins. Chuck in the chicken and cook it until it is beginning to brown. Add all of the spices and cook for two minutes. Add the tomatoes, beans and coconut milk. Bring to the boil, turn down and cook for twenty minutes. Add the drained kidney beans, cook for a further ten mins. At the end throw in the spinach and the lime juice. Just because you have decided to make a healthy start does not mean you have to miss out on your favourite dishes. A bit of creativity and boom, a healthy alternative with no cream is created! The fact that my husband did not even notice it was the healthy option speaks volumes!! Add the onions, green pepper, ginger and garlic to a food processor and whizz until it is a nice fine paste. In a large casserole (preferably non stick as you can get away with less oil!) heat a splash of oil. Add the paste and cook gently for around 5 mins. Add the chicken and cook for a few mins. Add the rest of the spices and cook for 2 mins. Add the coconut milk and cook for 20 mins with the lid on. Stir periodically. Stir through the Greek yogurt and the mango chutney add a little more yoghurt if it is too thick. Serve with brown basmati rice and some fresh coriander. Delish! I didn’t really know what to call this as I did not want to niche it! 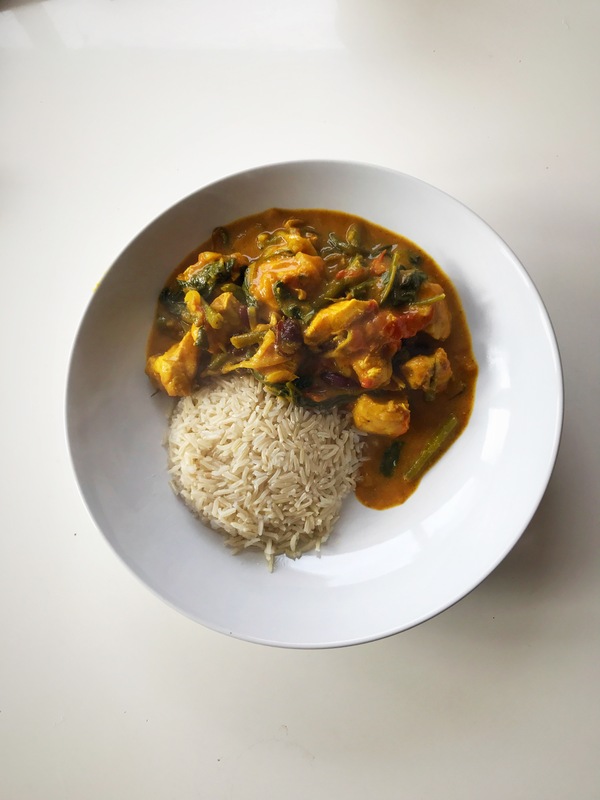 This white fish curry would appeal to those watching what they eat (clean/healthy eaters) as much as those who just love a really tasty curry. The key here is the wondrous paste, fresh and bursting with flavour! Serve with cooked brown rice. Place the garlic, onion, Coriander seeds, Turmeric, Cumin and Chilli in a food processor and blend to a super fine, smooth paste. Add the mixture to a heated frying pan. Cook for a couple of minutes. Add around 225ml water and bring to the boil. Add the fish and if necessary too up with a splash more water to ensure that the fish is covered. Give it a bit of a stir and be very careful not to break up the fish. Cook until fish is cooked through and serve with brown rice. You could throw in some spinach or cauliflower..whatever you fancy towards the end of the cooking. With kids back to school and lots of after school activities going on, a good one pot wonder that can be made ahead is golden! This a super tasty and mild curry! In a frying pan, heat the oil, add the onions, garlic and celery and fry gently for 5 mins or until softened. Add the ginger, chillies and curry leaves, cook for a further 3 mins stirring constantly. Add the lamb, ensure it is well coated in the spices and lightly browned. Stir in the tomato purée, water, coconut milk and tomatoes and stir well. Add the potatoes and carrots, stir well. At this point you could let it cool and put it in the fridge until ready for the slow cooker. I made it to this point the night before then put it in the slow cooker the next morning for dinner that evening. When ready put in the slow cooker on low for 6-8 hours. If you have no slow cooker, never fear, just use a large casserole, bring to the boil then transfer to the oven heated to 150c and cook for 3-4 hours or until tender. Serve with Indian Breads for a lush hassle free midweek dinner. I was thinking about a way to use up my leftover roast chicken from yesterday… I wanted healthy but not boring! I came up with this and threw it together really quickly. Feel free to throw whatever you fancy in….this was a bit of all I had in the fridge. Heat the oil and then add the onion, soften for around 5-7 mins. Add the garlic and fry for a further couple of mins. Add the chicken and the curry powder and stir well. Add the rest of the veggies and a dash or two of water to prevent sticking. Stir continuously for another few mins. Add the rice and combine thoroughly. Once rinsed, place the lentils and 1 litre water to a pan, bring to the boil and stir. Skim off any froth. Reduce to a simmer, cover with a lid and simmer for around 40 mins. Add some more water if necessary. When done, drain any excess water out, whisk to break the lentils up a bit. Set aside. Heat the oil over and medium heat and add the onions, fry gently for around 6 mins, stirring to ensure they do not burn? Add the cumin seeds, ginger, chillies and onion, continue to cook for another 4-5 mins. Blend the tomatoes and garlic to a purée then add to the pan. Now add the rest of the spices and 100ml water to the pan and stir well. If necessary, add more water. Stir in the chopped coriander and stir. Lush!!! Anyone familiar with Wagamama, will have encountered Chicken Katsu Curry! I thought I would give the sauce a blast at home. You could do your own chicken with panko breadcrumbs or, if you are short of time, cheat with some shop bought top quality chicken breasts in breadcrumbs. Heat some oil in a pan (not too big), add the onion and garlic, sauté for a few mins, then add the carrots. Sweat slowly for ten mins with a lid on. Stir from time to time. At this stage it should be nicely softened and caramelised. Stirring in the flour and curry powder and cook for a minute. Pour in the stock slowly, a bit at a time to avoid lumps. Add the honey and soy and bring to the boil, reduce heat and cook for 20 mins. Add the garam masala and whizz until nice and smooth with a hand held blender. If too thick add a dash of water. 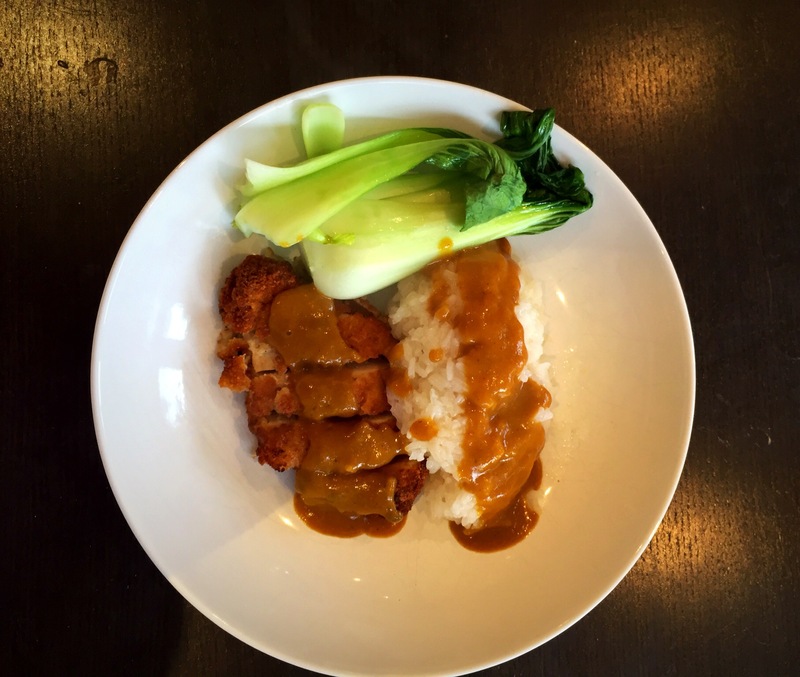 Slice the cooked chicken and pour over the sauce, serve with steamed rice and Pak Choi…Boom!